If all Broadway flops had a score like this one I would say “God bless the flops!”. I don’t know how it worked on stage, but this cast recording is exquisite and unforgettable. After turning Angela Lansbury into a Broadway star with MAME, Jerry Herman teamed up with her again for this musical adaptation of "The Madwoman of Chaillot" by Jean Giraudoux. Unfortunately, the audience and the critics didn’t like it and the show closed after a few weeks. Nevertheless, Lansbury won her second Tony with her performance. For the score, Jerry come up with one of his best and most accomplished works. In fact his score is among the best ever written for a musical. The music is fabulous, but Herman’s lyrics are the best ones he ever wrote. Just listen to the genial “The Tea Party” and you’ll understand; this song is a true masterpiece. He also gave us his most beautiful waltz ever, the haunting “I Don’t Want to Know”. But there’s more, the enchanting “Kiss Her Now”, the sad “And I Was Beautiful”, the funny “Garbage”. In fact, for me there isn’t a minor song here and, although I read the Herman didn’t like it, I really enjoy the title song (I’m a sucker for this kind of numbers). As for the cast, I can’t imagine anyone else as Countess Aurelia (the Madwoman of Chaillot). Angela Lansbury is perfection and puts her heart and soul in all her numbers, from “Each Tomorrow Morning” to “One Person”, she’s at the top her game. At her side, Jane Connell and Carmen Matthews are pure pleasure; together with Lansbury they bring the “house down” with the already mentioned “The Tea Party”. This is a cast recording that should be cherished by every musical fan. There aren’t many jewels like this one and I just wish that one day this musical will get the success it deserves. 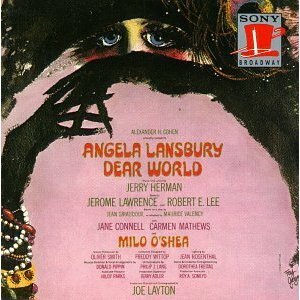 I've never seen Dear World on stage but I fell in love with the score the first time I listened to it - that was a vinyl LP album that I purchased for 99 cents at a local discount store back in the early 1970s. I was immediately enchanted by such gorgeous numbers as 'I Don't Want To Know", "Each Tomorrow Morning", "I've Never Said I Love You", "And I Was Beautiful" and "Kiss Her Now". Such a rich, lush, beautiful score! But the number that really sent me over the moon was "The Tea Party" trio. It is a mad, exuberant, joyful collection of individual melodies that somehow fit together in the final moments of the scene when the three mad women characters sing them simultaneously. I still feel a thrill of pure joy every time I listen to this wonderful number. Betty Buckley appeared in a London production, last year, directed by Gillian Lynne. I was hopeful that this production might spark renewed interest in Dear World leading to a new CD, a DVD or even a revival on Broadway. Unfortunately, the London production failed in find an audience and we didn't got a new recording of this fabulous score. Like you I love "The Tea Party", I think it's a musical masterpiece. I still hope that one day someone will be able to give new life to it, maybe a City Center Encores. You are probably right; City Center Encores is likely the best hope for a revival of any kind. If they do it, I will definitely book a ticket and a flight. Wouldn't it be marvelous if Encores did an entire season of Jerry Herman musicals? I would vote for Milk and Honey, Dear World and The Grand Tour. Harry, that would be a great City Center Encores season! If only Jerry Herman would allow it. I had seen the original production of Dear Word six times in 1969, and it has remained a part of me since. In 2012, I saw a production of it at the Light Opera of Toronto, and I still think it is a very special musical, my favorite Broadway flop ever. I think there is a myth that the original Broadway production (with a book at least co-written by Joe Masteroff, although he is not credited) was overdone and chaotic. In fact, the original production was magical. My only complaint about it are the lyrics of the title song, which need to be redone. If the title song had poetic lyrics and was sung like a prayer rather than a big production number, it would be great. However, a wonderful thing about the original production was Miguel Godreau, a ballet dancer, performing as the deaf mute during the title number. The new small version by David Thomson is okay, but I actually prefer the original production. One more thing. A wonderful few moments in the original 1969 production, which no subsequent production has, is the performing of the song "Garbage" by all of the madwomen and the sewer-man in a barge while riding through the sewers of Paris. I, too, saw the original production and it remains among my favorite memories. My roommate at that time, Zale Kessler, was the replacement for Milo O'Shea just before it closed. It deserves revival(s) with minor book alterations...as the theme is timeless and the score glorious. You two are really lucky guys! Thanks for the links, I'll give them a look. Evan, I'm sure I would have love to see the original production on stage. You're a very lucky guy!